When Liz and Bennett moved into their new home 8 years ago, they knew the “really dark and hideous” kitchen was high on their list of renovations. Why? Why? Because the kitchen really set the tone for the entire house because of the layout. Liz and Bennett enjoy having friends over for dinner frequently, and wanted their home to feel welcoming and comfortable. But then life happened. Other home repairs, like the roof, demanded urgent attention. Turns out the best things come to those who wait. 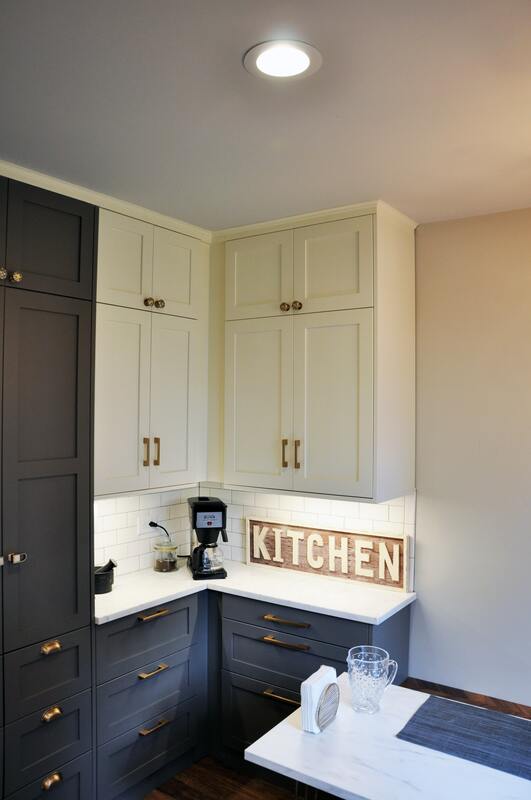 This beautiful classic style IKEA kitchen has several artistic touches we think our readers will really appreciate. Let’s dive into Liz and Bennett’s kitchen to see what it’s made of. The solution to the DDD threat is obviously a new IKEA kitchen. (This is the IKD blog after all). We hate clickbait just as much as you, so we’ll tell you right away: IKD designed this IKEA kitchen. But, the owner ended up not using IKEA for her kitchen! It’s a non-IKEA kitchen. It sure looks like an IKEA kitchen with grey BODBYN doors. That had been Bronwyn’s plan, but when her carpenter saw the plans he offered to build custom cabinets for less. We’d call that an offer she couldn’t refuse. 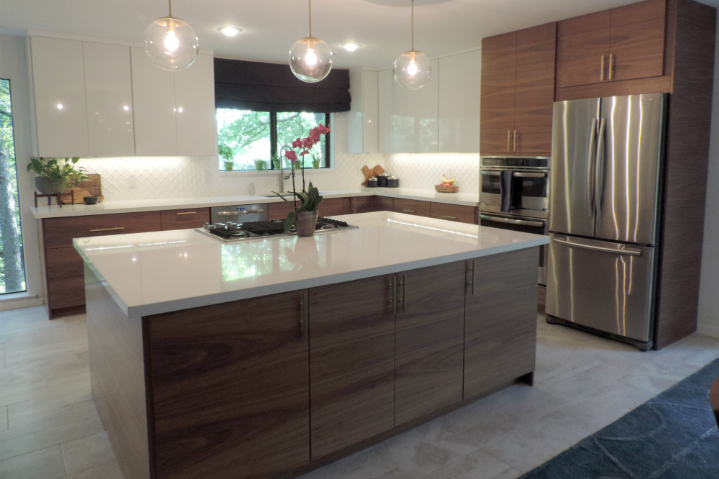 To understand Bronwyn’s kitchen, let’s start at the beginning: why she wanted to remodel her kitchen. The classic Downton Abbey kitchen was the source of inspiration for Laura and Tayloe’s kitchen design. Unlike Mrs. Patmore, however, the couple happily embrace modern technology like whisks, refrigerators, and IKEA. Let’s take a look inside this Downton Abbey inspired IKEA kitchen with BODBYN doors, cup handles, and butcherblock countertops. And for you home renovation junkies, you’re in luck. Laura and Tayloe are DIYers who took a lot of “during” photos so you can see just how involved this process really is! After you look at them you may want to just leave it up to one of our IKD Install Connect approved installers to do the dirty work. Any home built in the 1970s has its quirks, and IKD customers Andy and Michelle’s was no exception. Their home was what’s known as an “upside down” house because the kitchen and living areas were upstairs. The first floor was one open room with a small wet bar in one corner. When they bought it, Michelle knew she wanted to flip that house right side up. The new IKEA kitchen would go in the corner where the wet bar was, so they wouldn’t need to move any plumbing. And when they bought it, they began right away! And he and his wife, young child, college-aged niece, dog and cat all lived there during the entire 2-year home renovation. We’re not ones to judge…but the customer is always right! The other issue with the kitchen was how the counterspace was so broken up by appliances, there was only 24” of space on top of the dishwasher for food preparation. Since Jamie prepares all the meals for the week on Sunday, she definitely needed more room for this undertaking. The kitchen is the family hub for snacking, doing homework, and just hanging out. A better – and more aesthetically pleasing, shall we say? – layout for kitchen would make spending time together more enjoyable. A very drastic change! Let’s see what informed Jamie’s design choices and the super hot “drop zone” IKD designed for the family to leave their stuff.